Area: 111,369 sq. km. (43,000 sq. mi.). Slightly larger than Ohio in the United States. Monrovia is the capital city of Liberia in West Africa, it’s located on the Atlantic Coast. Over one million people live in Monrovia making it Liberia’s most populated city. Monrovia was founded in 1822, named after US President James Monroe, who was in favor of re-settling freed African-American slaves. As the city grew during the next century it was divided into two sections, one for the returning African-Americans and the other for the existing local population. The city continued to grow as more people moved into Monrovia from the countryside. You can fly to Monrovia’s International Airport via Belgium on Brussels Airlines, or via London on Astraeus Airlines. Regional airlines include Eylesian Airlines and Kenya Airways. Royal Air Maroc & other airlines. Liberian National Museum – looted during the war, but some interesting items remain. Providence island – where the freed American slaves first arrived. Mamba Point Hotel; Moko’s Bed and Breakfast; Royal Hotel; Kendeja Resort Villas (just out of town, where the old cultural center used to stand). More hotels …. Annual growth rate (2004): 2.4%. Health: Life expectancy (2003)–47 years. Work force: Agriculture–70%; industry–15%; services–2%. Liberia is traditionally noted for its hospitality and academic institutions, iron mining and rubber industry booms, and cultural skills and arts and craft works. But political upheavals beginning in the 1980s and the brutal 14-year civil war (1989-2003) brought about a steep decline in the living standards of the country, including its education and infrastructure. Liberia has a bicameral legislature consisting of 66 representatives and 30 senators representing the fifteen (15) political sub-divisions of the country. The legislature, executive and judiciary are three separate yet coordinate branches of government, each with specific constitutional functions, duties and responsibilities. This arrangement provides for a system of checks and balances of power among the branches. Legislative institutions are complex and multifaceted organizations. These institutions are considered the principal forum for debate on public policy issues and a place for compromise and consensus building. Moreover, legislatures reflect a broad spectrum of the country’s political opinions. They are central to democratic government, as long as they remain visible, accessible and accountable to the citizenry. There is a Supreme Court, criminal courts, and appeals court and magistrate courts in the counties. There also are traditional courts and lay courts in the counties. Locally, political power emanates from traditional chiefs (town, clan, or paramount chiefs), mayors, and district commissioners. Mayors are elected in principal cities in Liberia. Superintendents appointed by the president govern the counties. There are 15 counties in Liberia. GDP (IMF 2005 est. ): $548.4million. Real GDP growth rate (2004): 2.0%. Per capita GDP (2005): $119.4. Consumer Price Index (2004): 7.0%. Natural resources: Iron ore, rubber, timber, diamonds, gold and tin. The Government of Liberia has reported in recent years that it has discovered sizable deposits of crude oil along its Atlantic Coast. Agriculture: Products–coffee, cocoa, sugarcane, rice, cassava, palm oil, bananas, plantains, citrus, pineapple, sweet potatoes, corn, and vegetables. Industry: Types–agriculture, iron ore, rubber, forestry, diamonds, gold, beverages, construction. Trade (2004): Exports–$103.8 million: rubber 93%; cocoa 3.5%. Major markets–Germany, Poland, U.S., Greece. Imports–$268.1 million: mineral fuels and lubricants; food and live animals; machinery and transport equipment; manufactured goods; pharmaceuticals; and tobacco. The 1989-2003 civil war had a devastating effect on the country’s economy. Most major businesses were destroyed or heavily damaged, and most foreign investors and businesses left the country. Iron ore production has stopped completely, and Liberia cannot profit from timber and diamond exports due to UN sanctions. Its few earnings come primarily from rubber exports and revenues from its maritime registry program. Liberia’s Foreign Policy is firmly rooted in its political ideology of liberalism, democracy and capitalism. 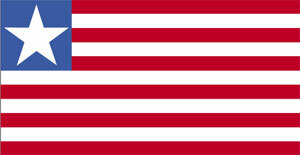 This foundation is copied after the pattern adopted by the United States of America from where the founding fathers of Liberia had come as ex-slaves and free men color. Generally speaking, the guiding principles of Liberia’s foreign policy has been the maintenance of national security and the preservation of the territorial integrity and sovereignty of the country, the promotion of peace and harmony based on the principle of non-interference in the internal affairs of other states, and unity in the national community based on the virtue of liberal democracy.The fundamental thrust of Liberia’s foreign policy objective before the Tubman era was predominantly the maintenance of national independence. Since the Tubman administration to date, the foreign policy objective of the country, in addition to the maintenance of national independence has been the devotion to economic, social and political development.Realistically speaking, Liberia’s survival as a state in the face of difficult challenges posed by colonial powers like Great Britain and France have been the skill and maturity with which her leaders conducted her foreign policy and foreign relations. Thus the mastery of the act of diplomacy has remained the hallmark, and one of the most credible achievements of Liberia in the comity of nations.